Greeting or Holiday Message - Share a warm message with the community. Wish the community a happy holiday, Shana Tovah or any custom message of your choice. This is an opportunity to show support and appreciation for the work of Chabad. Business Advertising- Get your business noticed! Chabad’s calendar is a good investment for your advertising dollars. Unlike newspaper ads that have a relatively short life span, potential customers view our colorful and informative Paradise Valley Art Calendar the whole year round, thus providing maximum return for your dollar. It is displayed in homes and offices throughout the community; thus ensuring optimum visibility for your products or services. Throughout the calendar we’ve reserved eye-catching space to advertise your business or service. By advertising with us you will gain the trust of the consumer who will appreciate you as a supporter of our community. Make sure the date is remembered. Bar/Bat Mitzvahs, Yahrtzeits, birthdays and anniversaries can be recorded as a great way to make sure an occasion won't be forgotten. 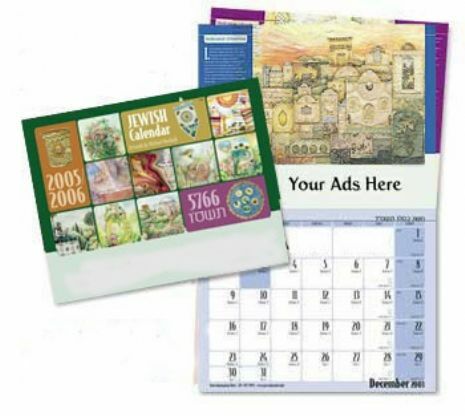 The calendar features opportunities for your family’s birthdays and Yahrtzeits to be printed on the date of the occasion. Click here to fill out our online form!